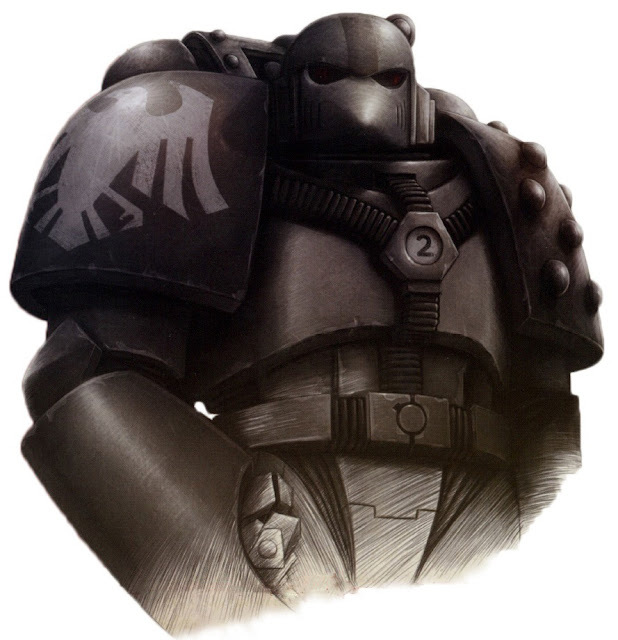 Throughout the timeline of the Horus Heresy, the Power Armor of the Raven Guard has changed more than any other Legion. The original Terran born Raven Guard Astartes wore grey armor with black heraldry and were not known as the Raven Guard, only the XIX. They wore MK II & MK III armor. Originally designed with the Great Crusade in mind, Mark II armour was was designed to be a fully enclosed environment more efficient cooling system, which reduced the size of the powerpack from MK I. This allowed space marines to engage in warfare any environment. In addition, unlike MK I Thunder Warrior armor, which only had enhanced strength incorporated in the upper body, MK II leg plates were articulated hoops to increase maneuverability. The enclosed helmet added enhanced sensory equipment and the tech was engineered to interface Astartes black carapace. The XIX legion fought heavily with the Luna Wolves under the leadership of Arkhas Fal. The majority of the legion during this time frame would have worn MK II armor. Mark III armour was introduced by the Squats as modified MK II armor for boarding campaigns. MK III provided better frontal protection for close combat as was the precursor to what would eventually become terminator armor. It was never intended to fully replace MK II, but instead to be used situationally, thus no Legion was every fully equipped in MK III armor. 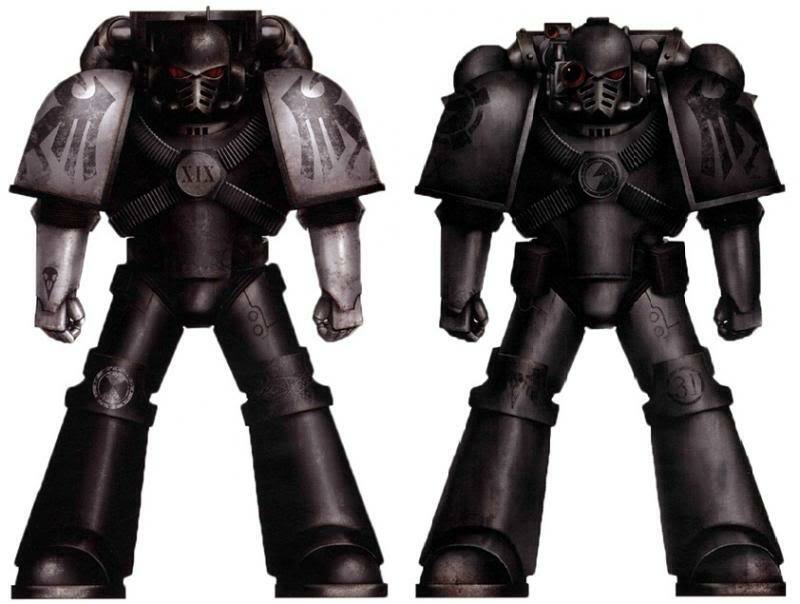 By the time of the Horus Heresy, the Mark III was slowly being phased out and replaced by Terminator armour. However, the brutal aesthetic of MK III appealed to certain legions and sets were kept it for honour guards or spear tip operations even into M41. Prior to Corax's return, the XIX legion's modus operandi was as a counter-insurgency, repression, and occupation force. Thus much of the imagery and art of the Carcharodons are presented in MK III. Corax disbanded the Carcharodons as a predation fleet which included Arkhas Fal soon after he joined the legion. That said, many Terran's continued to serve under Corax throughout the Horus Heresy. Representing them in MKII or MK III armor is a good way to delineate them as Terran born. MK IV was a major refinement towards modern Marks of power armor. The helmet was capable of movement and added advanced visual sensors. MK IV stripped down a lot of redundant systems and was lot lighter than MK II yet still offered advancements in protection. MK IV supply lines were manipulated by Horus, ensuring that Legions planning to be loyal to him were fully equipped with Maximum Armor prior to the Istvaan Massacre. As a result Mark IV was usually reserved for Chapter Masters and senior Captains of the Loyalist Legions. Post Dropsite massacre and into the Horus Heresy, Loyalist and Traitor Legions found replacement parts for damaged power armor hard to acquire. 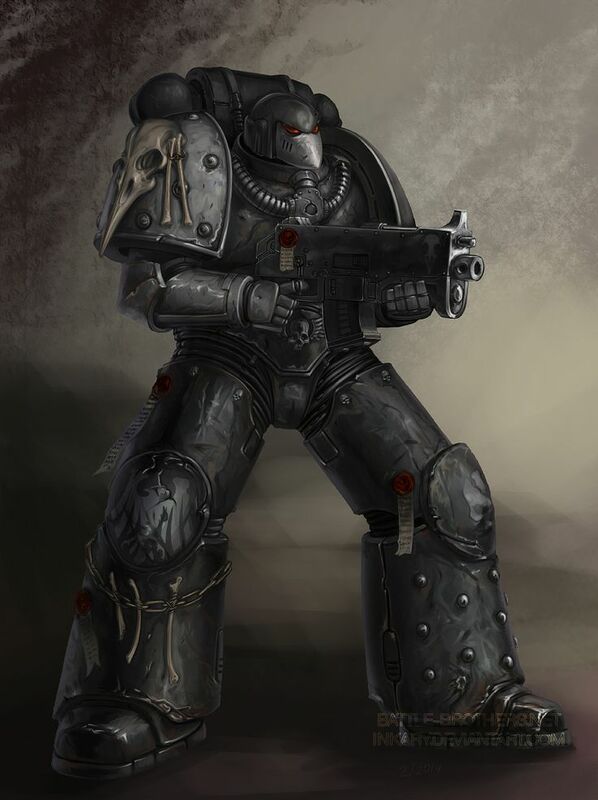 Thus, Legions were forced to combine parts from older Marks with newer marks of Power Armor. While the appearances varied widely from one set of armor to another, the result of its ad hoc nature led to some standardized forms, which became referred to as MK V Heresy Pattern armor. One of the more notable features was the introduction of molecular bonding studs on the left pauldron and both greaves. Shattered legions and Raven Guard survivors of the Dropsite Massacre would don Mk V armor comprised of armor plates of both loyal and traitor legions improvised together during field repairs. In addition, the Raptor Ruffs would would be another situation where you would find MK V armor that was customized to accommodate their horns, hoofs, beaks and tails. Prior the Dropsite Massacre, the next evolution of MK IV armor was being tested. 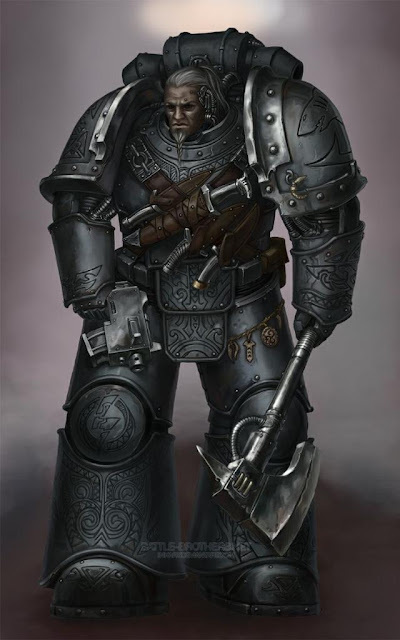 MK V armor (later to be known as MKVI) was to be tested the Raven Guard against a war in the Scalland Sector despite their recent heavy losses in the Akum-Sothos Cluster. It is speculated Perturabo pushed for the depleted Raven Guard to conduct the field tests in hopes of their failure and thus the cancellation the Mk VI project. Perturabo hoped this failure would spur the development of a new heavy assault variant in its place. Instead, the plan backfired as the Raven Guard with their advanced auto-senses and increased agility used a series of hit-and-run attack to expel the Eldar from the Sector altogether. As a result of their success, the Mk VI armour was approved for mass production. 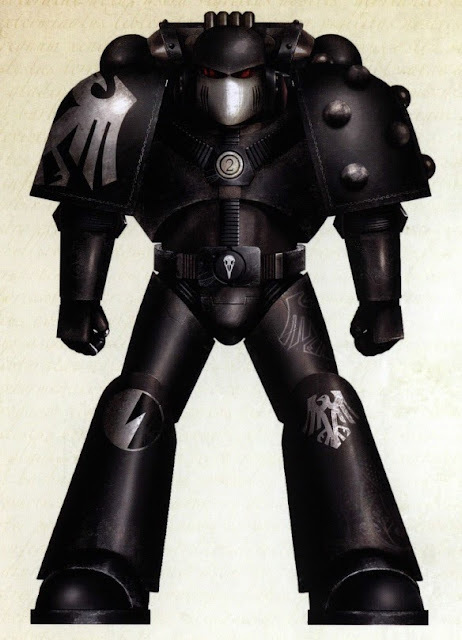 In the Raven Guard's Primarch Corax's honour, it was dubbed Corvus Armour. MK VI armor is also known as Beakie armour. Although it offered no additional protection, Mark VI armour was the first to feature a redundant power system and components are slightly interchangeable with those of other marks. MK VI armor is considered even lighter more stealthy than even MK VII armor and the beak of the helmet contained highly advanced sensory equipment. The Raven Guard received the first (non prototype) shipment after the Dropsite Massacre and the Raptors were gifted the new suits of armor. 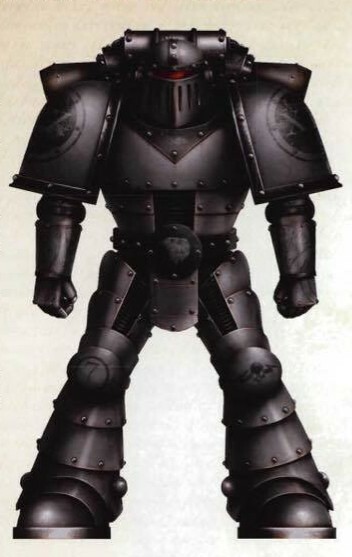 Later, the next wave of recruits from Deliverance that were to be called the black guard also wore MK VI. Interestingly, the Raven Guard would also have had a thousand pairs of MK VI prior to the Dropsite Massacre as well. Mark VII armor was being designed when the Traitor Legions reached the Sol System. While the final battle for Mars was underway, the Imperium realised the planet would eventually be lost. Rogal Dorn ordered the design teams transferred to Terra to prevent the Traitors from seizing the plans. As Mars fell to Horus, the new armour began reaching the Space Marines on Terra and Luna. Mark VII featured completely covered chest and arm cabling, a distinct helmet that provided more protection, a high level of compatibility with previous Marks, and also bore the Imperial Aquila on the chest, which was first used there to provide quick identification of the Loyalist Marines during the chaos Siege of Terra.